An interesting article from the UK , WE NEED TO HAVE THE AVIATION CONVERSATION critiques Norwich Airport’s expansion plan, to treble its passenger number over the next 30 years. It is an example of the ‘predict and provide’ model of transport planning that assumes continued aviation growth as the starting point for all policy, which is incompatible with action on climate change. The article is reposted from The Norwich Radical website. In northern England, Leeds City Council plans to release 36.2 hectares of land to enable expansion of Leeds Bradford Airport, supporting its goal of doubling passenger numbers to 7.1 million by 2030. The land is currently designated as ‘greenbelt’ – green space surrounding urban areas that is protected from development, in order to ensure than urban dwellers have access to countryside and prevent urban sprawl. Adjacent to the airport terminal, the land in question is currently used for farming. In addition to an increase in terminal capacity to accommodate more passengers the land would be used for commercial development to support the growth of Leeds Bradford Airport – an ‘airport village’ consisting of a hotel, restaurants and shops, an air freight park and an ‘air innovation park’. 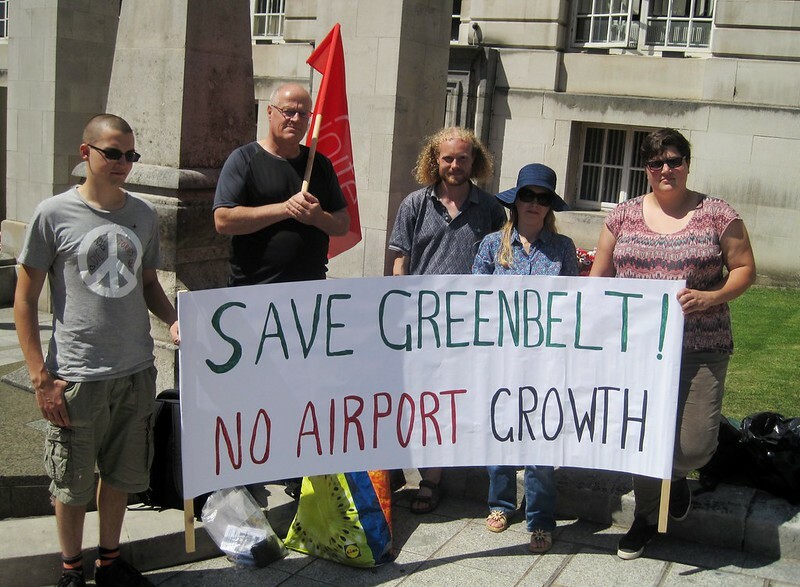 On 15th July opponents to Leeds Bradford Airport’s plans to concrete over greenbelt land gathered to protest outside the Leeds City Council Executive Board meeting which discussed the plans for a few minutes. As documented in the minutes of the meeting, attendees emphasized the Council’s continued support for expansion of the airport. The only note of caution was an assurance that consultation with ‘all relevant parties’ would be widespread and thorough. The report proposing allocating the 36.2 hectares of greenbelt land to Leeds Bradford Airport had already been discussed at the Development Plan Panel on 26th June 2015. Its a lengthy document – 176 pages long. On page 5, the issue that land at the airport is already allocated for ’employment’ so therefore available for development, with most of it remaining under occupied, is raised. Airport supporters’ response to this point is that the scale of land allocation proposed will make it an attractive location, and it will be supported by promotion and marketing internationally to prospective tenants. Bizarrely, the supposed solution to vacant business space is supposedly to provide even larger space, and the established business space should have received more promotion and marketing support to reduce the risk of it languishing unoccupied. It is not as if there is a shortage of business space in Leeds or Bradford. Both cities have plenty of vacant business premises, already constructed or on land with planning permission for industrial/warehouse development. An industry website lists 157 industrial properties available to rent in Leeds. The largest is a new development, Leeds Distribution Park, adjacent to Junction 47 of the M1 Motorway, with planning permission for industrial/warehouse development up to a maximum single footprint of 750,000 sq ft (17 acres). The website lists 40 industrial properties available to rent in Bradford. The largest is Bronte Business Park, boasting 16 acres of development land allocated for employment use. Leeds Bradford Airport, and its supporters at Leeds City Council, aims to support commercial development on greenbelt land with more than just promotion and marketing. They are angling for ‘Mini-Enterprise Zone’ status, as stated on the the document submitted to the Development Plan Panel, see page 13. This is already in place elsewhere in England, including at Manchester and Newquay airports. Designation as an ‘Enterprise Zone’ is a subsidy, as tenants are gifted a Business Rate tax exemption of up to £275,000 per eligible business. This tax break is unfair and unwarranted preferential treatment for tenants that are fortunate to be in the Enterprise Zone. In the case of airports, space in the Enterprise Zone is granted to businesses that are aviation dependent, thus maximizing use of the airport’s passenger and/or cargo facilities and facilitating airport growth. Businesses which do locate in the Enterprise Zone may not even create jobs, as firms will be incentivized to relocate from other premises in order to take advantage of the tax break. The argument that the airport-linked commercial development will boost the economy for neighbouring communities and the wider region, which the proponents of the project are most insistent about, is flawed. The shops, restaurant and hotel that are planned would result in air passengers spending more of their time, and money, on airport land, instead of stimulating economic activity in Leeds Bradford Airport’s host community. Another aspect of the rationale for commercial development on green space is to strengthen the case for more ‘surface access’ to Leeds Bradford Airport. This means construction of another road link, a dual carriageway from the A65 in Rawdon to the A658. It would not come cheap and taxpayers would have to foot the bill. It is anticipated that public sector funding will be confirmed for the new link road. The route of this road plan is not revealed. Figure 13 in the report discussed by the Development Plan Panel entitled ‘Indicative Alignment of New LBIA Road Link’ is not actually included in the report, it is ‘TBC’, left blank. Already, Rawdon Greenbelt Action Group is campaigning against the link road; they are concerned that enormous swathes of greenbelt land will be damaged or lost altogether, along with the special landscape character of the area. Leeds Bradford Airport’s ‘airport city’ plans are a smaller scale version of aerotropolis development that is already underway across the Pennine hills, at Manchester Airport. This is opposed by the Stop Expansion at Manchester Airport campaign group. There is also a Facebook page. Airport-linked business premises is being constructed on land formerly designated as ‘greenbelt’ and, under the guise of alleviating traffic congestion, construction of a link road, costing £290 million in public funds, has commenced. Calling the road a ‘relief road’ does not disguise the fact that it is designed to increase traffic to and from the airport. Most recently, hundreds of residents of High Lane village in Stockport, on the route of the new road, turned up to an exhibition to express their concerns over increased air pollution, noise and vibration from heavy vehicles. 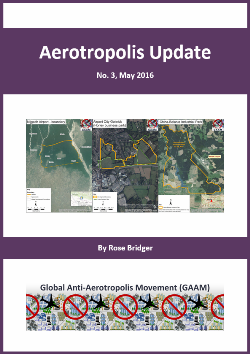 There is strong opposition to aerotropolis development on green space, and associated road infrastructure, at both Leeds Bradford and Manchester airports. Linking up these campaigns will strengthen them.